This picture was taken on Thanksgiving morning. 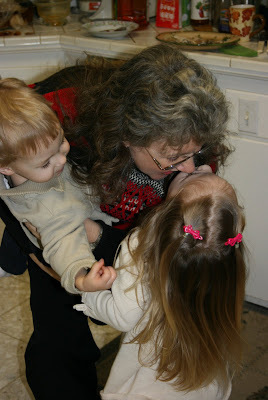 It is a picture of Noni (Jarrod's mom, DeAnna) greeting two of her three grandkids, our Elyse and Isaiah, as we arrived for dinner. It was our last Thanksgiving with my mother-in-law. She went to be with the Lord very suddenly on Palm Sunday of this year. Today Elyse told her daddy that she missed her Noni and wanted to go to heaven and see her. I thought it was fitting to share a little bit of her life with you for my Photostory Friday. Two weeks ago, while my son and very pregnant daughter-in-law were still packing up in the Texas piney woods for their move to the far southern regions of the state, Isaiah and Elyse stayed with me for three nights. To capture fully the heart of this picture, you must envision an 18 month old and a 2½ year old deprived of a bathtub. I live in a house built the same year I was born where for over a year the bathroom with the tub has not worked. Gratefully, I don’t need to rely on a sink and a washcloth, or a wooden tub in front of a blazing fireplace. I’ve another bathroom … with a shower. Elyse loves the shower; she has for over a year. She sings, often at the top of her lungs, and dances in the rain, spinning round and round and round, hands uplifted all the while trying to capture every drop. Getting her to come out is the challenge. Isaiah is another story. I’d hoped putting Elyse into the shower first, where her obvious joy mixed jubilantly with the showers, might, just might, spill over unto Isaiah when he joined her. NOT! I didn’t know whether to laugh or cry …or somehow indulge in both. From the moment the first droplet bounced off the tile floor onto Isaiah's little body, his screams drowned out hers … with on singular difference. Absence of any peace or joy, let alone enjoyment, marked Isaiah's cries. “He’p me! He’p me! Dada, he’p me!” reverberated off every wall, drowning out my own words of comfort. His were not quiet imploring words, but rather strident, demanding shrieks. There simply was no consoling Isaiah as those gentle, cleansing waters fell. No words of assurance brought peacefulness to his little heart. Not until I’d gathered up into my arms his little towel-draped body did his cries weaken and finally stop. Only then, at rest at last, did a sweet smile returned to his little face. All the while, Bella, face often turned upward, reveled in the cleansing rain. Her voice filled the cubicle with her gleeful laughter, while she graced the tiles beneath her feet with such joyful dancing I couldn’t help but glory, myself, in her submissive delight to the gentle power of those cleansing waters. For three nights, my heart drank in this unchanging lesson, unaware there even was one. It wasn’t until later, until after I took my grandchildren to their new home. On my two-hour return drive back to my home, reflecting on my time with the babies, I began to relive the nightly shower episodes. Only this time, it wasn’t Elyse, or Isaiah, beneath the cleansing waters. It was me standing there, beneath that cleansing flow. At times, like Elyse, I realize my soul rang with joyous gratitude … my face turned upwards, arms stretched delightfully overhead trying to capture every droplet, feet dancing with unrestrained songs of thanksgiving. More often, my own cries echoed Isaiah's. Inconsolable. Without understanding or gratitude. Or even the awareness that I frantically fought the necessary cleansing of the showers of God’s truth. Heavenly ears lovingly bore the heartbreaking pain of my own pleas, pleas every bit as desperate as Isaiah's. He’p me! He’p me! Dada, he’p me! I realized, then, as I reflected on my own life through this shower filter, that I’d never been without my Father’s help, my Father’s safekeeping, my Father’s gentle embrace or soothing voice. Whether I’d gloried in the moment like Elyse, or fearfully fought against it like Isaiah, my Father’s love for me never wavered … neither did His faithful presence both with me and for me. Such, I picture my life. I know it a true picture, a faithful picture. In many ways, we never stop being children before God. Most often, when faced with the choice between Eden and Gethsemane, Eden’s garden seems so much more delightful. But, our soul, frolicking in Eden’s self-delight, becomes soiled, and we don’t even realize it. When Love brings His cleansing showers, we fight them, we fear them, even as His arms wrap gently, lovingly around us.